Emery, C. (1895) Viaggio di Leonardo Fea in Birmania e regioni vicine. 63. Formiche di Birmania, del Tenasserim e dei Monti Carin, raccolte da L. Fea. Annali del Museo Civico di Storia Naturale di Genova (2) 14 : 450-483. Total length of workers around 3.5 mm. Body color black, with light brown mandibles and legs. Antennal scape exceeding posterior margin of head by the length of the second antennal segment. Lateral surface of propodeum more or less sculptured, opaque. The male is characteristically pale in colored and has reduced mandibles. 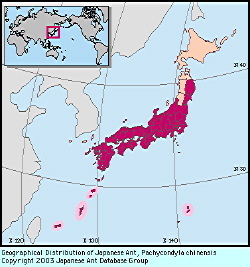 Teranishi (1929) suggested that P. chinensis is a predator of termites, but there are no relevant field observations. P. chinensis is found at the margins of woodlands. It is common in southern Honshu and the more southern Japanese islands. The species name solitaria F. Smith 1874 is a junior primary homonym of F. Smith 1860b. The present combination is based on the treatment in Bolton (1995). Honshu, Shikoku, Kyushu, Nansei Is, Ogasawara Is; Mainland China, Korean Peninsula, Taiwan, New Zealand (introduced). Original text by Kazuo Ogata. English translation by Kazuo Ogata, edited by Robert W. Taylor.